Beau Austin of Pembrokeshire, South Wales, discovered his mother, Jess, had fainted due to the side effects of morning sickness medication. The child, who was used to talking to digital assistants like Siri and Alexa, used his initiative to ask his mother's iPhone to dial the UK's emergency number 999 for him, putting Beau through to an operator. The BBC reports he told the operator "my mummy's sick," and while Ms Austin did recover enough to confirm her address, she fainted a second time. Beau was then coached by the operator on ways to keep his mother conscious until the ambulance arrived. "It was just me and Beau in the house by ourselves, so he did really, really well," said Ms Austin. "To use Siri like that is incredible. I didn't even know you could do that on a phone." Beau claims he learned how to ask Siri to call for help after seeing it done on TV. 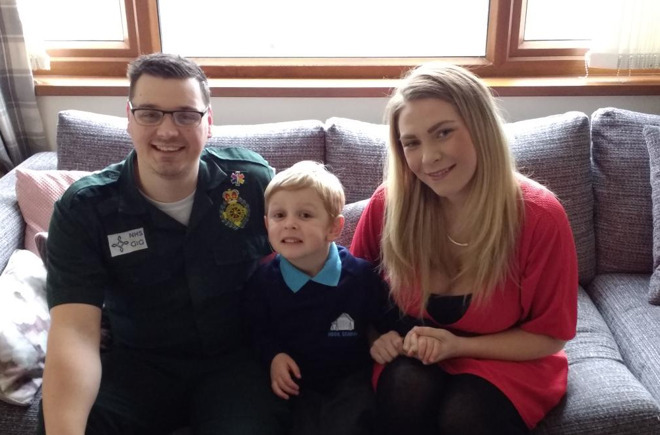 "As call handlers we are trained to talk to callers through potential emergencies, and it was Beau's knowledge of technology, awareness of his address, and staying calm that really made a difference and helped his mum and us," advised Ashley Page, the Welsh Ambulance Service operator who took the call from Beau. As a reward, Beau was visited at his school by the ambulance service's mascot Jack and the Patient Experience and Community Involvement team, where he was presented a certificate and a goodie bag. "Beau's story shows how important it is for children to know their home address, including their postcode ideally," advised Fiona Maclean, Service User Experience Manager for the PECI team. "We engage with schools and communities to encourage children to learn their home address and what to do in an emergency." Aside from being able to request emergency services via Siri, Apple has been steadily improving the ability for its products to get assistance for its users as quickly as possible. The release of iOS 12 enabled emergency services in the United States to gain more data from a 911 call via RapidSOS technology, and the Apple Watch Series 4 includes a fall detection feature that can call for help automatically. Other notable cases where Apple's products helped in emergencies include the Apple Watch's SOS feature bringing aid after a crash by a drunk driver in late 2017, and Siri being used to call for help following a motorcycle crash in Australia. On Monday, it was revealed an iPhone was instrumental in helping call for help after a chartered boat capsized off the coast of Japan. Way to go, Beau. Having said that, I expect if this had before the age of the smart phone, he would have done exactly the same thing--picking up the phone and dialing 9-9-9 as kids were taught to do. Saw it on TV. Just goes to show, kids absorb everything they see and experience. Like cute little alien sponges. Ya, this is the modern thing to do. Kids should still learn how to call for help the old fashion way. 9-9-9 there, 9-1-1 here in the U.S. Whatever it is in the other countries. Here's a list of Emergency numbers for around the world. When you travel, it's good to know them!!! That's one lucky mom. There is a high probability Siri could have called, Energy Workout center, Hospitality Suites and Inns, Emerging Markets Inc., or the Andy B. Lance fish and chips store located 4.5 kilometers to the south of them which is moderately expensive and is rated 4.3 stars. Way to take a positive story and hijack it for your negative agenda. Merry Christmas. edited to remove a non-displaying emoji of a Christmas tree. Outlines the importance of teaching very young children their address. That is one sharp 4 year old. Speaking of Alexa, Amazon released Alexa Guard, which listens for things like breaking glass or smoke alarms, alerts the owner and offers to provide a live feed of the home even if it's just audio. The future of personal security/health is quickly improving. That's one way of putting it. I think George Orwell had a different take. I remember in college (over 30 years ago) the two year old daughter of a fellow student was able to log onto the 3278 terminal from watching her mother do it so often. Took her mom 15 minutes to figure out that she couldn't get in because her daughter was already online in the cubicle next to her. I'm just not that impressed with this story. Responding to 911 or 999 requests are something Siri probably has done at least 5 years. Or should have. My three kids (10,8,6) all use Siri heavily, for all their searches and queries. I hardly use it, prefer to type out my searches. It is just second nature to them to say, Hey Siri. When I type, they often say...Just ask Siri. To them Siri is almost a real person. Actually, I did something similar years ago for my grandson when he was about 5 years old: I added his mom's cell phone number on my iPhone's contacts as "Mom" and taught him to tell the phone "Call Mom". Plus, I had him use it regularly to check in with his mom ("We're at McDonald's be home soon") while we were out so he remembered how to use it. This kind of thing can be a great safety device for confused older people as well as young kids.